I’ve been circling around this book for a while and when I was confronted with a three-hour train ride, I decided on buying it. 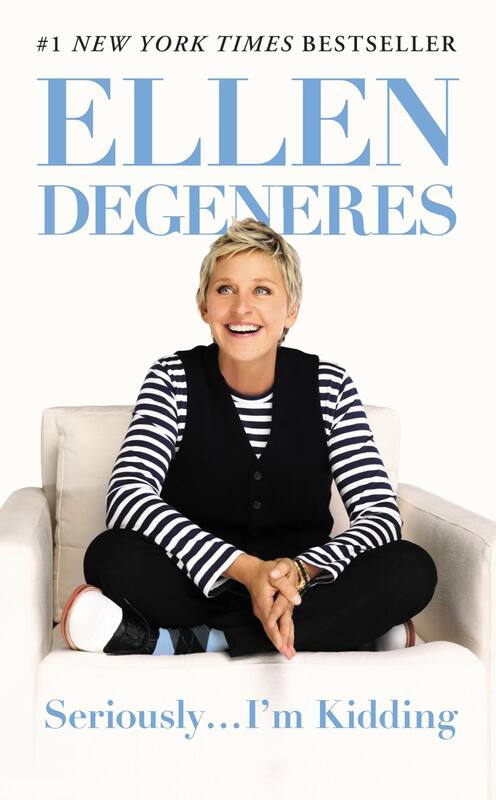 Seriously… I’m Kidding by Ellen DeGeneres is what people will read if they only get to watch youtube clips of her show because it isn’t broadcast in their country. I’ve experienced a lot the last few years and I have a lot to share. So I hope that you’ll take a moment to sit back, relax and enjoy the words I’ve put together for you in this book. I think you’ll find I’ve left no stone unturned, no door unopened, no window unbroken, no rug unvacuumed, no ivories untickled. What I’m saying is, let us begin, shall we? In Seriously… I’m Kidding, Ellen takes us on a journey through her world in the spotlight and her innermost weird thoughts. She describes situations that are too strange to be true and more than once makes us laugh out very (!) loud. So be careful if you are in public. Let’s just hope you don’t read on an e-reader or listen to the audiobook. 😉 People can’t see what you’re reading, you know. Unfortunately, there are chapters in this book that are less fun and, to be honest, quite boring. I had the feeling that those chapters were just there to fill up the pages. I don’t know about you, but I’d rather read a book that’s short and fun than long and boring. As you can see, I have mixed feelings about Seriously… I’m Kidding. But as this book isn’t a novel, you could just skip the boring chapters as soon as you notice they get boring. I did read them all though. I’d say Seriously… I’m Kidding is a book for the quick laugh on a train, in the bathroom, or waiting for your doctor’s appointment. It’ll be like Ellen is right there with you, if you want to listen to her stories, or not. I really enjoyed this book overall but I’d definitely agree there were a few chapters that were a bit boring. You might like Is Everyone Hanging Out Without Me and Other Concerns by Mindy Kaling if you haven’t read it. Oh, and after another delay the wisdom tooth is coming out tomorrow so wish me luck! I’ve never heard of Mindy Kaling. I must look her up! I’ll keep my fingers crossed for you tomorrow! Tell me how it went! She’s really funny! You’ll have to let me know if you read it. Well I got the tooth out – it was a bit more awkward than they’d thought and there was a lot of bleeding yesterday which meant 2 trips to the dentist. Now it’s just bit swollen and sore. Fingers crossed the problem is solved now! Too much bleeding doesn’t good. I’m glad that seems to be over. So what do you think on the whole? Horrible or not? 🙂 I’ll keep my fingers crossed for you too! Ich hab schon eine Kritik zu diesem Buch gelesen und diese war sehr, sehr positiv. Interessant, dass es nich durchgängig so ist! Ja, Ellen ist ja generell der Knaller aber ich hatte bei dem Buch einfach das Gefühl, dass ihr zwischendurch mal der Stoff ausgegangen ist.